Bilbo Baggins was a respectable hobbit. He “never had any adventures or did anything unexpected.” Until the wizard Gandalf and an unexpected party of 13 dwarves arrived one day on his doorstep. Suddenly, he found himself off to the Lonely Mountain to retrieve the dwarves’ stolen treasure from Smaug the dragon. 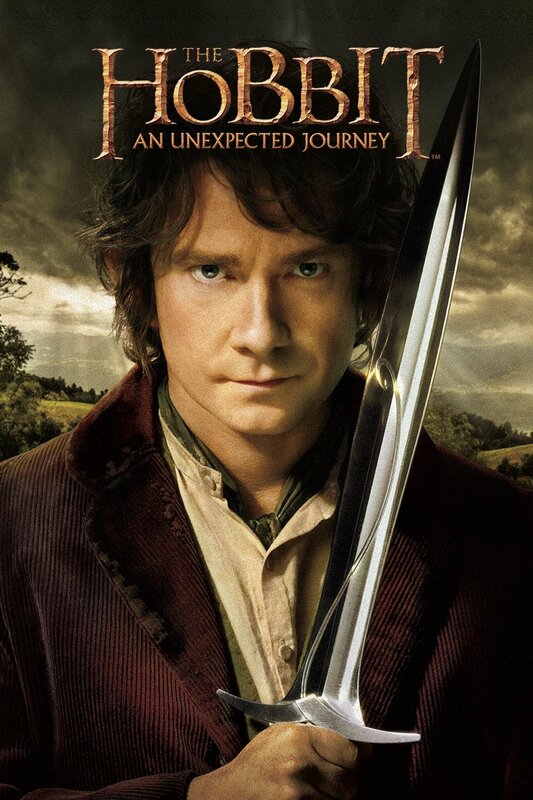 The Hobbit is a year-long journey with classic Tolkien adventure. The Hobbit explains how Bilbo came to find the ring of power and sets the stage for The Lord of the Rings trilogy. It introduces hobbits, elves, dwarves, and wizards and some of how they each came to be on Middle Earth. It also, in a veiled way, tells part of Sauron’s tale. It’s a fun, event-filled story all its own but it is NOT a sweeping epic with desperate stakes like LOTR. It is merely an exciting treasure hunt. And this vast difference is why I wonder if The Hobbit will be as successful on the big screen as The Lord of the Rings. The stakes simply are not as high. Don’t get me wrong, it’s loaded with suspense and high action which I expect will make the movie highly entertaining. But it lacks the purpose given to Frodo’s task as well as the deep friendship that develops between Sam and Frodo. Bilbo is on his own among dwarves and his quest rather frivolous. It’s simply not as weighty. Yet the story holds some surprises and ends with a history-altering event that trumps the quest for gold. In fact, by the end the value of wealth is quite called into question and a few hard lessons are learned. And once again, or rather for the first time, we are shown the nobility of this race called hobbits. Hmmmm…I guess I’ve proven rather prophetic, haven’t I? The creators of the movie had to invent a villian for this one–the white orc with his personal vendetta against Thorin’s family–to try to up the stakes. And instead of focusing on the book’s main objective, that of reclaiming the dwarves’ treasure, they attempted to instill some nobility by turning it into a quest to reclaim the dwarves’ mountain “homeland”. Finally, they cooked up a special friendship between Thorin and Bilbo to try to recreate some of the magic of LOTR. I predicted all these issues, and all attempts to make The Hobbit more than it really is fell flat. Though I didn’t say so, I also predicted a trilogy would be WAY TOO MUCH movie for this story. At the time of my review, the trilogy hadn’t been announced yet, and I thought maybe they could squeak a two-part movie out of the text. Maybe. I was so disgusted when I found out it would be three parts. And that has been my biggest complaint each time. They’re too long! Which makes them too slow. And the battles are way over done. It detracts from the simple charm of the book. My final thoughts? The Lord of the Rings is still my all-time favorite epic, both book and movie. I’ve read the trilogy at least half a dozen times and watched the movies enough to memorize large chunks of dialogue. The Hobbit (the book) is charming, but it’s a distant cousin, notable mainly because of the background it provides. I’ll probably never watch the movies again. However, I’ve become a true Martin Freeman fan. When does the next season of Sherlock come out? Exactly. The third movie was basically one really long, violent battle. LOTR does suffer from this quite a bit, too. I fast forward through the battle scenes most of the time and it makes the movie a more manageable length. But without the battle scenes in Five Armies, there isn’t much left. Jackson does have some great stuff in these films, particularly when it comes to the dragon. If someone would only sift through his footage and mash together the good stuff, we’d have *one* killer adaptation of the book. You know, I had this discussion with husband. I loved the Hobbit but could not imagine it being made into a trilogy for the reasons you mentioned. Didn’t like the epic Lord of the Rings movies. So I completely avoided seeing the Hobbit. Prefer the book. Yeah, the Hobbit was just plain disappointing. When I skip over the battle scenes in LOTR, the movies are perfect, lol! Part of the fun of the LOTR movies was watching them each fall with my kids when my husband went hunting–my battle abbreviated version. I completely agree with your comparison of Hobbit and LOTR: “charming” and “epic” should never by hybridized.